Embarking on the raw food path is like preparing for an exciting adventure, and one of the key areas that requires some thought and planning is setting up your kitchen to support your raw food lifestyle. Having the tools you need to create different meals will certainly go a long way and different kitchen tools serve different functions and will help keep your meal creation fun, diverse and interesting. Having the right kitchen tools can also make your life easier and make your food preparation less time consuming, especially if you’re making raw food for your family or endeavoring to embark on a raw food career, whether it be catering or coaching or teaching classes. In this post I’ll start guiding you to setting up your raw food kitchen by covering my top four most frequently used kitchen tools. Going out and purchasing these all brand new can be quite expensive, but you may already have one or two of these items stowed away and (almost) long forgotten underneath your counter. If you do happen to have several of these items, its high time to pull them out, and dust them off and make room for them in a place that’s easily accessible. If you are working with a budget, be sure to check my top 6 tips for setting up your raw food kitchen on a budget. Tip: If you don’t own any of this kitchen equipment already and you have a limited budget, then you may want to consider focusing on acquiring one at a time, based on what your personal preferences and needs are. I personally would recommend a blender first, and then choosing between the other 3 essential kitchen tools based on personal needs. If I had to recommend only one essential kitchen tool, it would be a high-powered blender. I often use my blender upwards of 1-2 times a day for a very wide range of raw food recipes. I almost always start my day off with a smoothie, using it to blend a wide range of fruits and leafy greens. I also make most of my salad dressings in the blender as well as nut milks and raw vegan cheeses. It can be useful while making desserts if you’re going for a very smooth texture, especially for puddings and also comes in handy for making sauces, dips and soups. 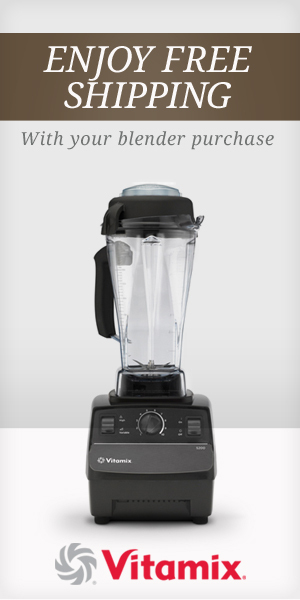 That pretty much covers the range – see how useful a high-powered blender can be? Notice how I keep mentioning the “high-powered” part? I highly recommend going all-out and purchasing a higher-quality blender with a powerful motor that usually cost in the $300-$500 range. I’ve gone through so many cheaper $50 blenders and keep burning out the motors and I actually would have saved money if I had just bought the more expensive one right away. I can’t emphasize enough the difference that a high-powered blender makes, if you have to wait to save up, it’s worth the wait. if you have are also preparing food for a family, I recommend the 5200 Deluxe Complete Kitchen by Vita-mix if you’re only preparing for yourself I recommend either the new S30 or the 5200 Getting Started Vita-mix blender. I’ve had my Vita-mix for many years now and it’s stood the test of time. I wrote a post about choosing between the Blendtec and the Vita-mix but updated that post after using a blendtec for 3 months at my moms place. After that experience I definitely re-evaluated my opinion! Both are great options with slightly different features. There’s also a lot of buzz about the Omni V 3 HP Blender. Tip: When looking at blenders, or any other pricey kitchen tool, I highly recommend taking the time to read customer reviews. The next three items are totally based on personal preference. When I first went raw, I used my dehydrator a lot more because I was still transitioning, but I still use it for special meals, and for raw food catering. I use my juicer a lot, however sometimes I go through periods when I use it less. I also make a lot of raw food for events and for larger groups of people, which makes my food processor more than essential as a time saving measure. The next three essential kitchen tools at not listed in order of importance. Due to the size of the “S” blade in the food processor, it serves a different but complimentary function to that of the blender. Although it doesn’t get food quite as smooth as a high powered blender, it’s still an essential tool for processing food down, especially for dips like raw pesto and raw zucchini hummus, sauces like marinara for living pesto pasta as well as a wide variety of pie fillings. I also use it for making my raw crackers and raw bread mixes. Food processors also come with several different blades, including a shredder and a slicer, so I often use it to shred different vegetables more quickly like carrots, beets and zucchini. If I’m making an apple pie, I use my food processor to slice apples at my desired width, and does an excellent job saving me time. I personally use the 14 cup Cuisinart, which has been good and served it’s purpose but after only 5 years of using it, albeit quite extensively, I’m ready for an upgrade. The Cuisinart is probably the most widely used food processor with a lot of great reviews. They are reliable but they might cost more than you’re willing to spend. I really like the 14-cup size and would actually consider going bigger than that, but if you mostly make food for yourself or a small family and don’t plan on making big batches of crackers or dips, the you might want to consider the 7-cup, 10-cup or 12-cup varieties. When I got my first excalibur dehydrator, I loved it. I played with a wide variety of recipes and was really able to recreate some of my favorite cooked recipes in their ‘raw’ version. When I’m consulting with clients I remind them that using the dehydrator is a great transitional way to get started on the raw food lifestyle. My emphasis is on transitional because many people tend to get stuck here, over-consuming mostly high fat, dehydrated foods at every meal. I think it’s great to play with a wide range of recipes with a dehydrator, but these foods should not constitute the primary bulk of foods consumed. That being said, it can be a great step for a lot of people, and I know it definitely was for me. I highly recommend that instead of buying wheat and gluten based crackers, for example, you try making your own raw crackers with raw, organic vegetables instead. Using a dehydrator can also be really helpful to warm up your food in the winter months and to achieve those crunchy textures that you might miss from a cooked diet. The possibilities are pretty much endless when it comes to the dehydrator. You can make raw cookies, crackers, veggies burgers or raw beet chips, fruit leather or raw stuffed peppers or mushrooms with unlimited combinations of herbs, spices and seasonings. You can also use it to slightly warm a meal or for drying herbs. I personally use the Excalibur dehydrator (9 tray), I have two of them and have found that quite handy with the level of food production that I do. I’ve also used the stainless steel TSM dehydrators, which are great but don’t come with a temperature gauge. It’s worth looking into both of these options. I’ve also used the Good4U dehydrator, which is also a good option, but still prefer the Excalibur, but it is worth looking into the options and reading reviews to see which dehydrator suits your needs the best. I love making fresh green juices like the complete protein raw green juice or clear skin juice. And a juicer is pretty essential for making juices! But shopping for a juicer can be more tricky than initially thought because there are actually quite a few different kinds of juicers – from centrifugal juicers to single or double masticating juicers. I do not recommend the centrifugal juicers simply because they are not great for juicing leafy greens or wheatgrass. The masticating juicers have a wider variety of functions. These juicers come equipped with different pieces so you can do other things with the juicer as well, like make ice cream from frozen fruit. The “blank plate” also enables you to make nuts or seed butters although the end result of these nut butters are not as good at making them in a stone grinder. Juicing is a great way to get lots of vitamins and minerals in your diet. It’s also great if you want to do your own juice cleanse at home.There are many juicers on the market, with a wide range of prices. I bought the Omega juice (8006 model), a single gear masticating juicer, and I’ve been very happy with it. It’s also worth looking into the twin gear masticating juicers, like the Green Star, Norwalk, and the newer Angel Juicer which is a stainless steel juicer. Champion also has some commercial juicer models that are worth looking into but I don’t typically recommend the old-school centrifugal Champion juicers. Those are my top four essential raw food kitchen tools that I recommend when setting up a raw food kitchen. I do recommend trying to get the best quality you can find, so that it will last you a long time instead of continuously having to re-buy cheap tools. I recommend buying a high-powered blender first, getting used to that and going from there. I accumulated these tools over the period of about a year when I first started and it was actually really nice to get used to using them a little more gradually. Want to learn more about raw food? Check out our Raw Food Hawaii Retreats and come join us in Hawaii for a raw food adventure! Good luck on your raw food adventure! Post any questions you might have down below! Yes there is a difference between blending and juicing: When you blend, you keep the fiber, juicing removes the fiber.